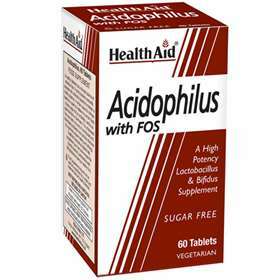 HealthAid Acidophilus with FOS is a vegetarian food supplement to help support balanced intestinal flora, to maintain good digestion and support healthy immune function. Free from Sugar, Artificial colours, preservatives and flavourings. Helps to maintain good digestion. May be beneficial to people with hectic lifestyles, following a course of antibiotics, or need to improve digestion of lactose. Tablets coated to help withstand stomach acid so ingredients reach the intestines. Adults and children over 12 years of age, one to two tabletsdaily before food. This product contains soya and whey (milk). Bulking Agent (microcrystalline cellulose, whey (milk) powder), Anti-caking Agent (di-calcium phosphate di-hydrate, stearic acid, magnesium stearate) Coating methylcellulose (HPMC), Fructooligosacharides (FOS), Bifidobacterium Bifidus and Lactobacillus Acidophilus.